If your eyelashes are sparse and breaking off, there's hope. You can make them grow in strong and long with eyelash growth serum. You may have heard about a prescription solution called Latisse. It has a reputation for getting results, but at the cost of some unwanted side effects. It’s a prostaglandin with hormone-like effects. Its original purpose was to reduce pressure in the eyes of glaucoma patients, but it has an unusual side effect. It causes eyelash growth, with a few other side effects. But we've found other eyelash growth products that can produce long eyelashes without changing the color of your eyes or discoloring your skin. Plus, you won’t need to visit a doctor to buy them. Before we jump into the reviews of the best eyelash growth serums, we’ll mention here a few reasons why eyelashes break and thin out, as well as what ingredients can reverse those effects. Once you’ve noticed that your lashes are looking thin and small, you can immediately make changes to reverse that. If possible, stop using mascara for a while. If you wear it anyways, remove it as gently as possible with a product made for that purpose. And before you apply mascara, use an eyelash primer to strengthen your lashes. What can heal eyelash thinning and breakage? When you want to heal your eyelashes and make them strong and long, you have several kinds of products you can try. One of the most popular natural options is castor oil. Many people apply a thin coat of castor oil to their lashes and eyebrows at night. It takes time to see results, but it’s an all-natural solution with practically no side effects (unless you’re allergic). Those who can’t use castor oil also try olive oil or even petroleum jelly. In professional products, you’ll often see biotin, peptides, keratin, and glycerin. The first three ingredients strengthen hair while the last one attracts moisture into the lash itself. Now let’s dive into the reviews to see which eyelash growth serum will help you look your best. We'll begin with an award-winning product that seems to satisfy most users. Revitalash’s Advanced Eyelash Conditioner gets mentioned a lot on beauty websites and in magazines. It contains a secret formula with BioPeptin Complex and botanical ingredients that literally moisturize eyelashes. As a result, lashes feel strong and flexible and they even appear shiny. You only need to apply Revitalash once a day to get results within 6 weeks or less. Etude House’s My Lash Serum is a South Korean product that you can wear underneath makeup or by itself. While it contains parabens, it’s also packed with herbal goodness. The label lists ingredients like aloe, ginseng, comfrey, and a skin conditioning herb called swertia japonica. Users report that their lashes look longer after only one month of use. Rimmel of London offers an Accelerator Serum that strengthens lashes with a clear coat of keratin and biotin. It also contains castor oil, caffeine, and hyaluronic acid—ingredients that hydrate and nourish eyelashes. Some users use this formula on both lashes and eyebrows. It works well underneath mascara. GrandeLash says their eyelash conditioner has amino acids and peptides to encourage healthy lash growth. Some users have reported amazing results in only one month. Neulash Lash Enhancer Serum lists plant extracts, peptides, and vitamins on their label. But they also reportedly make use of an ingredient called isopropyl cloprostenate, which is similar to bimatoprost, the ingredient in glaucoma eye drops as well as Latisse. It makes eyelashes grow, but it may have the same undesirable side effects as Latisse for some people. The Lashes To Die For Turbo Nighttime Treatment has garnered recommendations from beauty sites as well as reviewers online. Its peptide-containing formula is designed to be as non-irritating as possible for sensitive skin. It doesn’t contain parabens, phthalates, or sulfates unlike many other cosmetics on the market. The company says their eyelash serum supports healthy lashes during all three stages of the hair growth cycle. They did 4-week long tests on volunteer users. Over 90% of those users reported longer, thicker lashes. As a result, you should be able to see a difference in as little as 4 weeks of once-a-day use. Talika’s Lipocils Eyelash Treatment Supplement strives to overcome the damage that pollution and makeup do to lashes. Their formula contains soy and witch hazel to reduce inflammation without drying out your eyes. Then allantoin hydrates the lashes so they recover their natural flexibility. VitaLash has a top-selling serum that was developed by a licensed esthetician for a medical spa. They report that it’s safe for contact wearers to use. The ingredients contain vitamins, amino acids, and peptides to help re-grow hair and strengthen lashes. You only need to apply it on your upper eyelids along the lash line once a day. Then let it fully dry before applying other makeup. Boots No7 offers a less-expensive lash serum that seems to work for a lot of customers. They say it’s non-irritating even if it gets in their eyes. You can expect results within 8 weeks or less. ArtNaturals is known for many botanical cosmetics and skin care products. Their Eyelash Growth Serum uses an unusual ingredient to stimulate lash growth. It’s “Swiss apple stem cells,” which work right at the hair follicles to help hair grow in healthy and strong. (Apparently, these stem cells aren’t necessarily from a Swiss apple tree.) On the label, they are listed as Apple Fruit Cell Culture Extract. The label also lists myristoyl pentapeptide-17 which actually was proven to help lashes and eyebrows regrow thicker. And like other ArtNaturals products, this one is cruelty-free and paraben-free. Ardell’s Brow and Lash Growth Accelerator has the power of protein and conditioners to revive brittle lashes immediately, then help the new growth to come in strong. Some of those proteins come from soy and wheat and castor oil. Speaking of castor oil, if you’re willing to try it, it’s a natural product that’s worked for a lot of people who want to strengthen their eyelashes. Yes, this is plain old organic cold-pressed castor oil. Castor oil isn’t something you’d want to make yourself at home because it comes from a toxic plant. But in its final oil form, it’s an ages-old remedy for a lot of skin problems. It’s rich in Vitamin E and omega fatty acids. Just apply a little oil along the edge of your eyelids, then go to sleep. It might take a little longer than other commercial products, but you don’t have to worry about eyelid discoloration or other side effects. Here’s another brand of castor oil. It comes in a handy bottle with a pump dispenser so you can easily use it for more than eyelashes. If you purchase a large container of castor oil, this kit from eBoot makes packaging it a snap. It comes with an eyelash wand, a tube for your homemade castor oil “mascara,” plus a little funnel to help you fill the “mascara” bottle. It’s all well and good to tell you to buy a product that will solve your problems, but some problems are hard to solve. An eyelash growth serum might be exactly what you need, but first you’ll need to baby those lashes a little first. Like we mentioned earlier, take the time to remove your eye makeup in a gentle way. Use a makeup remover, or Micellar water at least. Moisturize your face and consider using an eye cream as well. If you have serious eyelash loss, you might even need to forgo mascara and eye makeup for a couple of weeks while you use a serum to regenerate new lashes. If you can avoid rubbing your eyes, that can help, too. Rubbing them, especially when you have on mascara, can twist off and break those delicate little hairs. As for mascara, it’s a smart idea to use a primer underneath it. A primer locks in moisture and makes your mascara perform like a champ. 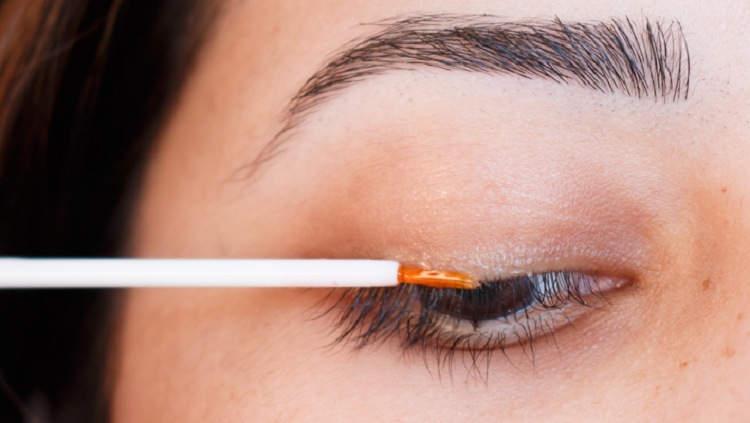 Your lashes will automatically look thicker just from combining these steps. And while we’re on the topic of primer, here’s one that comes highly recommended. Biotin is Vitamin H, a B-complex vitamin you can eat in foods like whole wheat, bananas, egg yolks, pecans, almonds, and sardines. Or you can purchase a hair growth supplement with biotin. Then you may find that hair on your head starts flourishing, too. Antioxidant vitamins like C and E stop hair from splitting and drying out. If you have brittle eyelashes, you can try raising your intake of these two vitamins. Foods with big doses of C and E are citrus fruits, avocados, and green leafy vegetables like spinach. If you’re not a fan of castor oil or allergic to it, olive oil may be enough to help your lashes recover. It will condition them at least. Put a small amount along your lash line at night before bed. Consider using the most organic, natural brand you can find instead of an overly processed oil. Emu oil comes from the emu bird of Australia. While studies show that it’s a great skin conditioner, keep in mind it’s harvested from animals. If you prefer cruelty-free, you might pass on this solution. In conclusion, you have many options for restoring your eyelashes. Of course, if you have a serious health condition, you might be limited in what you can do until your health improves. Otherwise, brittle and thin eyelashes might be a temporary problem that you can solve in a month’s time. In between the all-natural solutions like castor oil and prescription medications that just might change the color of your eyes, there are many serums and conditioners on the market. Many users all around the world report success using them. We’ve done our best to select the best eyelash growth products for you here. We hope you find the perfect one that gives you the thick, long lashes you desire. If you have concerns about hair loss, take a look at our massive review of hair growth products. Or if you want to erase years from your face, we have several reviews of anti-aging products and devices. Check back with us again soon for new reviews of the best in beauty products.